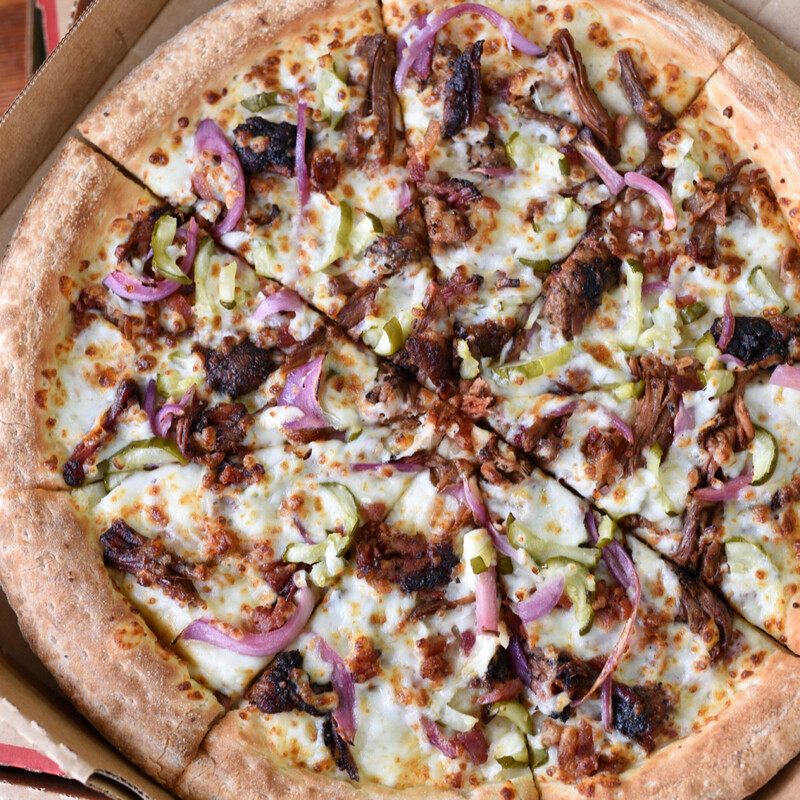 This week, I reached out for out for new — uh oh, worlds are colliding — Killen's BBQ Brisket Pizza from Papa John's ... with an asterisk. 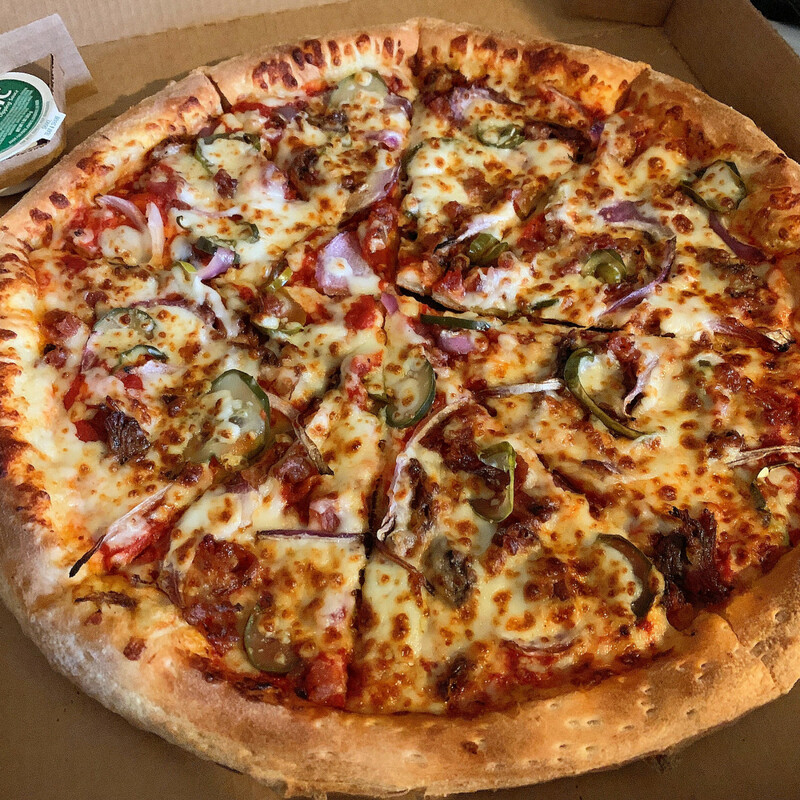 This mashup of food giants, Killen's Barbecue restaurant and Papa John's Pizza, is only available at Keith Sullins' "Houston Pizza Venture" group of 77 Papa John's Pizza locations in the Houston area. Even though Killen's BBQ Brisket Pizza is not sold system-wide at Papa John's, Sullins still had to get national corporate approval for his Killen's collaboration. "This was about an eight-month process," says Sullins. "It started when I was talking with Ronnie Killen at a Texans football game. Papa John's and Killen's Barbecue are both inside NRG Stadium. Jamey Rootes, the Texans' president, saw us talking and suggested that we should do something together. Ronnie visited our store down the street from his restaurant in Pearland, and that's how it started. Papa John's corporate gave us the go-ahead after checking everything out for food safety and other details." Here's the blueprint: about 7 ounces of Killen's slow-smoked brisket, standard issue cheese, a ladle of pizza sauce, and a ladle of Killen's signature barbecue sauce on either thin crust or hand-tossed crust. It's a unique flavor, for sure. 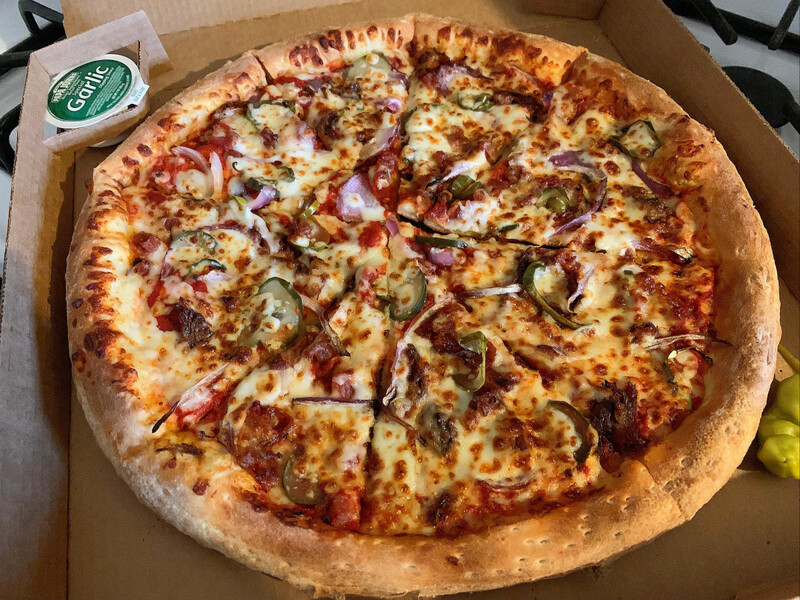 While we don't have exact nutritional numbers, a typical Papa John's pizza with meat toppings has about 300 calories and 16 fat grams per slice. We do have the precise price: $17.99. Expensive, but you're getting real-deal, internationally celebrated Killen's brisket without having to wait in line outside his restaurant. Time is money. Part of what makes brisket taste good is its rich, fatty texture, but shredding the brisket mostly ruins that. On the plus side, the smoke comes through strongly enough to cut through the dominant flavors of the cheese and sauce. The pickles and onions provide some welcome crunch and pops of acidity that help balance out the flavors, too. As delivery pizza goes, it's solid. If I had to choose, I'd lean towards Cane Rosso's new Tuesday night special that uses brisket from Truth Barbeque — they cut it into cubes to preserve the texture — but that's only available in one place on one night of the week. Full credit to Ronnie Killen and Papa John's for figuring out how to make their pizza available for lunch and dinner citywide. Going in, I had one chief concern: would this be actual Killen's barbecue, or just some knockoff that Killen put his name on for a money grab? It's like that with Nathan's Famous hot dogs, one of my favorites, but only at a legit Nathan's hot dog stand. When you buy Nathan's hot dogs in the supermarket, the name's the same, but all similarity ends there. Sullins assures me, the Killen's brisket on Papa John's pizzas is honest-to-goodness Killen's brisket. Well...it's brisket prepared according to Killen's obsessive specifications by J Bar B Foods in Waelder — as Sandler recently reported. It's a quantity thing. Seventy-seven Papa John's restaurants demand lots and lots of brisket. As Killen told Sandler, after reaching confidentiality agreements, Killen gave the J Bar B staff his recipe and exact instructions how to prepare and cook the brisket. It was Killen who came up with the 50-50 sauce. He wanted to maintain some old school pizza flavor in his new barbecue pizza. 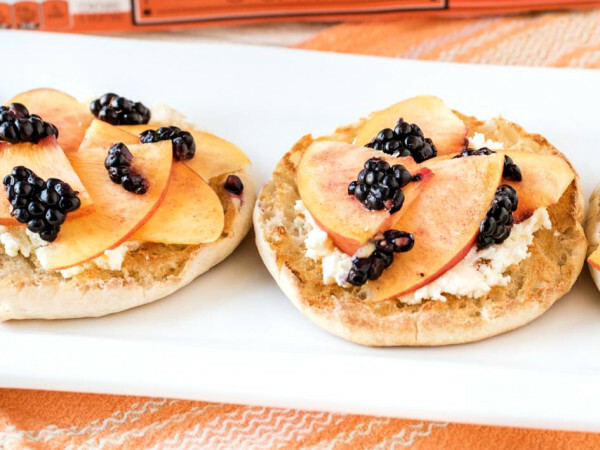 The overall eating experience is different — this doesn't taste like a pepperoni or plain cheese pie from a corner Italian pizza joint. Also, remember, the brisket goes through a Papa John's chain-link pizza oven, and it's sitting on top of blended barbecue-pizza sauce. So it's a whole lot of different. Not sure this would click up north, but down here, should be a hit if only for Killen's reputation. When something involves barbecue, you don't argue with Killen, you just stand back and wait your turn to eat. The result is a pizza that definitely boasts a flavor that's more Texas barbecue than Italian pizza. Barbecue-style pizzas with brisket or pulled pork on top have been around for a while. While pizza snobs may wrinkle their nose at the thought, have you looked at a calendar recently? It's rodeo time in Houston. Most of us would eat a cowboy boot if it were dipped in barbecue sauce. Tossing Killen's barbecue brisket on a pizza is a natural 'round these here parts. 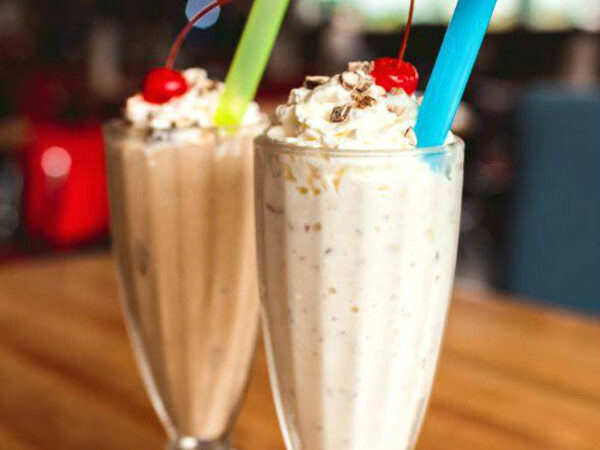 If you're going to break tradition, do it with the best. It's round, but to me, this is more of a barbecue meat dish than a regular pizza, but that's probably it's biggest plus. You may have noticed that barbecue is pretty popular in Houston. 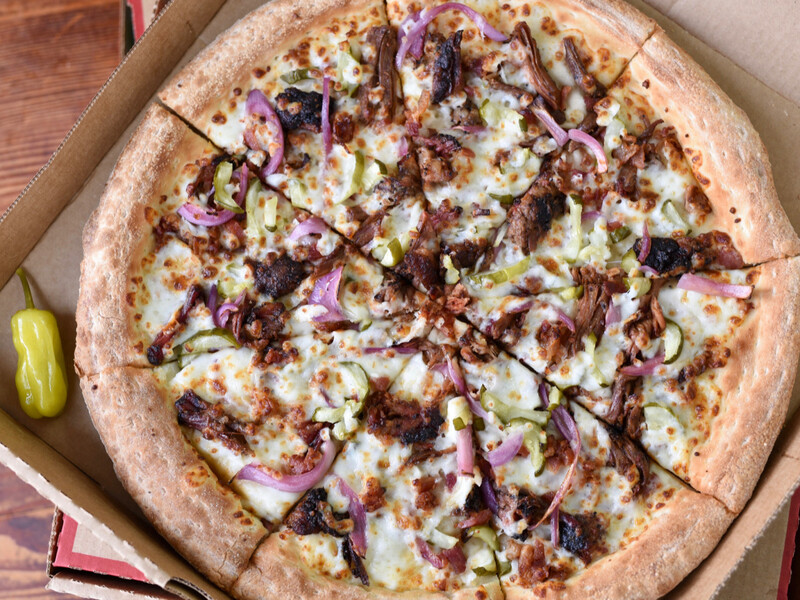 While Killen's BBQ Brisket Pizza is a limited-time-only special, going bye-bye March 31, get ready for more brainstorms from the Ronnie Killen and Papa John's connection. "Ronnie told me he's got three more pizzas in his head ... and he tells me the next ones are even better than the brisket pizza!" says Sullins. Killen told Sandler that those plans include a short rib pizza with Killen’s coffee barbecue sauce, a smoked sausage pizza with peppers, and a pork belly pizza.